When talking about benefits of physical activity, most of the times the focus is on healthy people and improving their fitness or reducing the risk of heart diseases, certain cancers, diabetes type 2 . Not much is known about the impact of exercise on Hashimoto’s , so we asked you what works the best for you. How can a person diagnosed with Hashimoto’s benefit from exercise? 1. Regular exercise will improve the function of the immune system. Regular exercise strengthens the immune system and makes people more resistant to certain infections, such as the common cold . Hashimoto’s causes inflammation and doing regular exercise will prevent or lessen inflammation by reducing the number of cytokines (molecules promoting inflammation) [4–6]. It will also impact the number many immune cells in the body (neutrophils, monocytes and natural killer cells) . Physical exercise reduces stress levels, which are found in excess in Hashimoto’s thyroiditis . For any person diagnosed with an autoimmune disease, it is crucial to keep their body lean, as fat triggers an ongoing inflammation in the body . Regular exercise is indispensable for preventing health complications. It will improve insulin sensitivity [5, 6] (important for diabetes), reduce blood pressure  and reduce the risk of heart-related complications [10, 11]. 4 in 10 of you that exercised regularly feel relaxed and happy the day after your exercise routine, while only 1 in 10 of non-regular exercisers feels the same. 3 in 10 of people that exercise regularly feel focused the day after the exercise and between 1–2 in 10 of people who don’t exercise regularly feels the same. 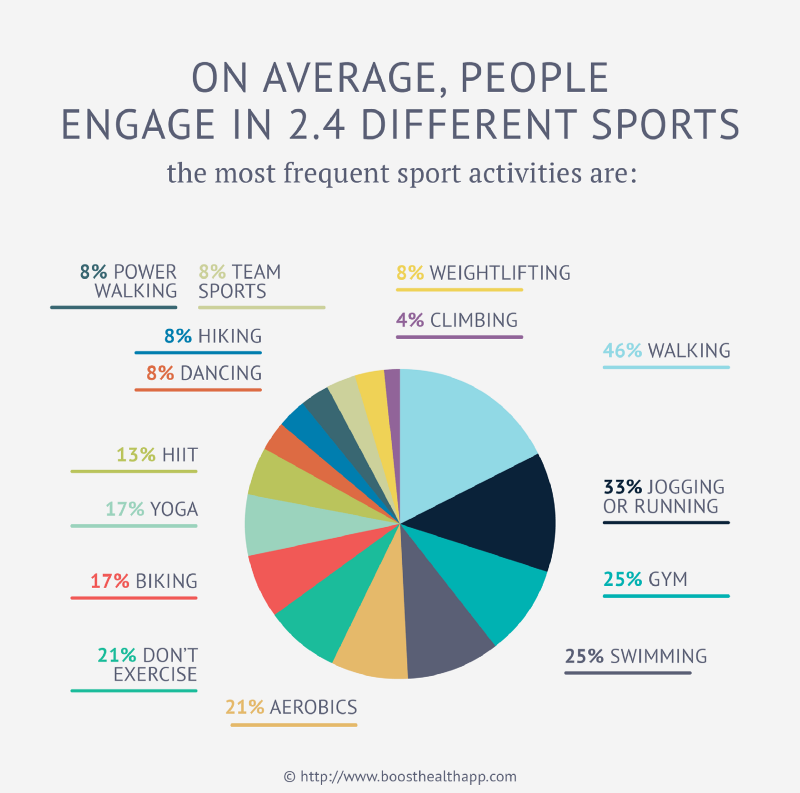 1–2 in 10 of regularly exercising people feel energised the day after the exercise, while none of the non-regular exercising people feel energised. The intensity of exercise is important in determining how will you feel. 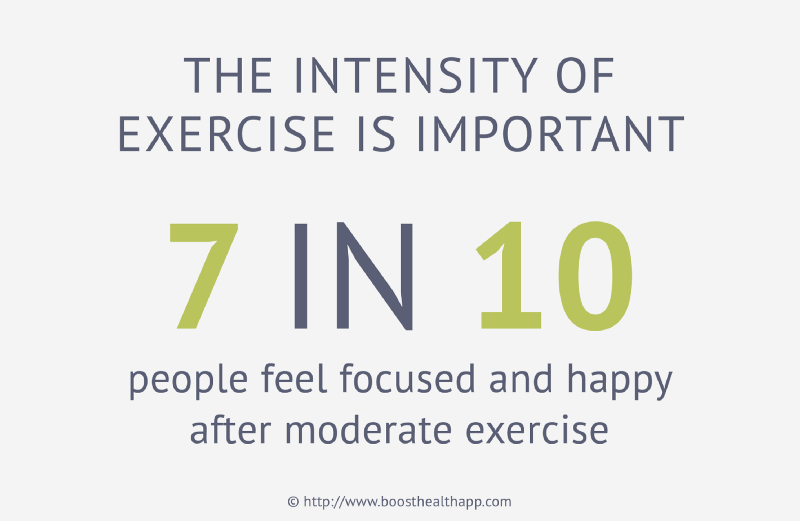 Moderate exercise seems to bring the best feelings in most of the people with close to 7 in 10 people feel focused and happy. Exercise can help with flare-ups, and for 2 in 10 people it will help reducing flare-ups every time. Aerobics and running are the most common physical activities helping to reduce flare-ups. What should a person with Hashimoto’s avoid when exercising? Too intense, too lengthy or too frequent exercise will use up a large portion or even most of the available T3 (free T3). This means there will not be enough fT3 to complete all the basic daily functions, as there may not be enough time for restoring normal levels of thyroid hormones T3 and T4 [12, 13]. How will you know if you have over exercised yourself? If you feel tired, weak and out of focus for the next day or two, you have likely over exercised yourself. What to do? Try reducing the intensity, length or frequency of the exercise. General recommendations are for people to allow a day or two resting period between workouts and to establish personally what is a good balance of exercise for yourself . 1. Warburton DE et al. Health benefits of physical activity: the evidence (2006). 2. Lankhaar JA et al. Impact of overt and subclinical hypothyroidism on exercise tolerance: a systematic review (2014). 3. Pedersen BK et al. Effects of exercise on lymphocytes and cytokines (2000). 4. Codella R et al. The anti-inflammatory effects of exercise in the syndromic thread of diabetes and autoimmunity (2015). 5. Adamopoulos S et al. Physical training reduces peripheral markers of inflammation in patients with chronic heart failure (2001). 6. Nicklas BJ et al. Behavioural treatments for chronic systemic inflammation: effects of dietary weight loss and exercise training (2005). 7. Walsh NP et al. Position statement. Part one: Immune function and exercise (2011). 8. Walter KN et al. Elevated thyroid stimulating hormone is associated with elevated cortisol in healthy young men and women (2012). 9. American College of Sports Medicine. Position Stand. Physical activity, physical fitness, and hypertension (1993). 10. Paffenbarger RS et al.. Physical activity and hypertension: an epidemiological view (1991). 11. Xiang GD et al. Regular aerobic exercise training improves endothelium-dependent arterial dilation in patients with subclinical hypothyroidism (2009). 12. Ciloglu F et al. Exercise intensity and its effects on thyroid hormones (2005). 13. Al-Hashem F et al. Exhaustive exercise and vitamins C and E modulate thyroid hormone levels at low and high altitudes (2012).